by prelates and clerics within the jurisdiction of the Stephenian Patriarchate. in the Cæremoniale Aulae S. Mariae Walsinghamensis. pectoral cross is generally worn over the hood. 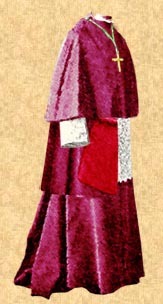 The mozzetta of a bishop or archbishop. 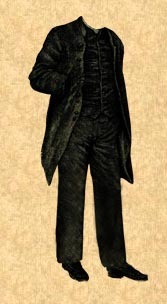 bishop and constitutes his primary habit. their territory or of an auxiliary bishop. when outside their territory. 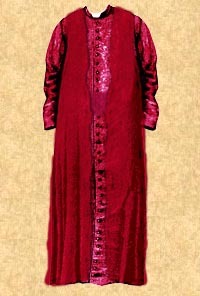 It is also worn by the Archdeacon, Deans ad Honorem, and Canons of the Patriarchal Chapter. on a purple and gold cord. Canons do not use the pectoral cross. 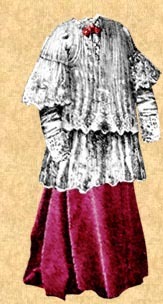 The mozzetta worn with the mantelletta underneath. always by the Archbishop Coadjutor of the Patriarchal See and, in scarlet, by the Governor-General. over the black clerical cassock. The mantellum of a Chamberlain. 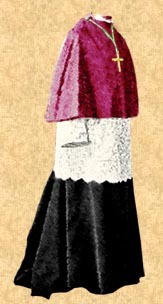 the Household and the Train Bearer, both over a purple cassock with black buttons, trimmings, and cuffs. with purple ferraiolo worn off the shoulders. 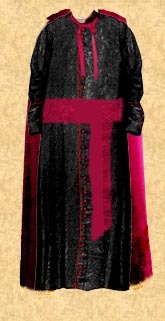 black clerical cassock with black fascia. 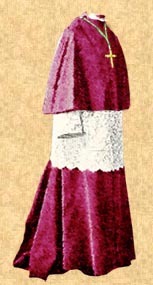 Informal abito corto of a cleric. fashion to the house cassock. 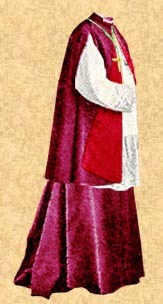 Abito corto may be worn in most situations in which the house cassock may be used. 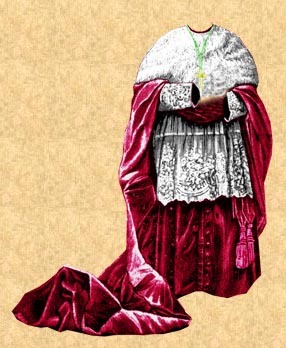 and a stole of plain cloth over the red mozzetta (usually purple; rose on rose days) are used in penitential seasons and for mourning.